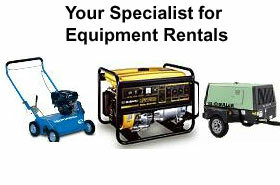 Depend on Indy Sales & Rentals, Inc., for a nice selection of equipment available for rent and sale. Our family-owned-and-operated business offers competitive rates and great service on everything we have in stock. Whether you need to do some work around your house or you are a contractor with a job to complete, we have what you need. It is our goal to constantly deliver customer satisfaction, which we ensure by having the finest products at the best prices. Contact us today with any questions about what we currently have available, or to make reservations for whatever you need. Call us for more information on our inventory.